Sapna is an angel investor, retail expert and three-time entrepreneur. Through Red Giraffe Advisors, Sapna makes angel and early-stage seed investments in retail, fashion and consumer start-ups and offers advisory services to early-stage companies. Sapna is also the founder of Retail X Series, a retail startup boot camp program for pre-seed stage founders who are revolutionizing the future of retail. Previously, Sapna co-founded Retail Eye Partners, an independent Wall Street equity research firm. Sapna also co-founded a menswear e-commerce retailer, Mind the Chap. Prior to Retail Eye Partners, Sapna held executive strategy roles at Linens 'n Things, Inc. and at Ann Taylor, and spent time at Gap, Inc. Previous to her career in retail, Sapna worked in investment banking at Punk, Ziegel & Knoell and in credit at Morgan Stanley. Sapna received her B.S. in Economics from the Wharton School as well as a B.A. in East Asian Studies from the College of Arts & Sciences at the University of Pennsylvania. She received her M.B.A. from Columbia Business School. Aubrie Pagano is Co-Founder and CEO of Bow & Drape, a customization brand that celebrates showing your big personality. At B&D, she has driven the business to success, retailing online and in over 300 stores including Nordstrom, Bloomingdale's, and Saks and partnering with everyone from The New York Post, Dominos, and artist Donald Roberston. She was named Forbes 30 Under 30 in Retail, PayPal's 30 under 30 Makers + Shakers, LinkedIn's Next Wave of Professionals under 35, and introduced the world's first 3D printed accessories in market according to WWD. 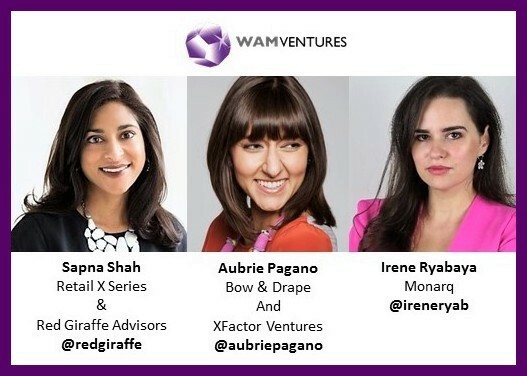 Aubrie also serves as an Investment Partner at XFactor Ventures, a venture capital fund that focuses on first-in capital for billion dollar businesses with at least one female founder. She holds a BA from Harvard and began her first business when she was six. Irene Ryabaya, Co-Founder of Monarq, investor, adventurer, techie, introverted networker & accidental feminist. Monarq builds diverse networks, accelerates revolutionary ideas & funds women-led startups. Monarq is the first women focused incubator in NYC. After a decade in finance working on various commodity trading desks, Irene is dedicated to creating more women led startups via strategy consulting, direct investment and deep impact events. Irene is also an advisor to Quentin Road Ventures. She was a trader with Hess Energy Company and technology lead for the commodities trading desk at Goldman Sachs. Irene graduated from New York University with a degree in computer science. WAMVentures welcomes the fall season!